In Kansas this past weekend a white supremiicist/Nazi wannabe (Frazier Glenn Cross) shot and killed three people at two seperate Jewish-affiliated Centers; a teenage boy and his grandfather at a Jewish community center near Kansas City and then a woman at a nearby Jewish assisted living facility. This man is obviously a sociopath who needs to be removed from society. Whether or not he “hated” jewish people is completely irrelevant. Nonetheless, he will be charged with three hate crimes. In my view: the time and money it takes to research Hate Crimes Legislation or do the paperwork required to bring the Federal Government into the investigation (hate crimes are Federal crimes and must be tried in a Federal court) are a complete waste. Beyond that, a crime like unjustifed cold-blooded murder, whatever the motivation, especially when it is committed by a person with this man’s reputation and criminal record, after conviction, should be punished by death, without concern for what was going through his sick mind. Hate crime legislation in general is an Orwellian idea that does nothing but de-emphasize the crime. If you intentionally, unjustifiably kill someone — you should loose your life and if the execution is carried out humainly in a prison it has no impact; it does virtually nothing to prevent another murder by another criminal. Yes even a piece of trash like Frazier Glenn Cross deserves a trial by a jury of citizens, but if found guilty of unjustifiable murder there should be no recourse; the “trash” must be taken out. Taken out in a controlled public setting and executed in the same or a similar manner as his victims were executed. Hate crimes legislation only applies when the victim of the incident is a member of a “protected class.” These protected classes include race, color, religion, national origin, age, gender, disability and sexual orientation (added last in June of 2013). Under Federal Law there are increased penalties for crimes against people who are members of these classes if it can be proved that the crime was committed specifically because of the victims status under one of these classes. The message apparently is: ‘if you just have to kill someone tonight, it’s better to kill a young, straight white guy’! His life is far less valuable than a minority life! Is that really a message we want to send? It has been proven time and time again, the threat of increased penelties has no effect on someone who is predisposed to committing a crime. I believe that taking the punishment phase of the crime of murder out of the shadows, out of the basement of a Federal Prison, broadcasting it live on PBS and broadcasting it on closed circuit television to every prison cell in the country, would have a much greater effect on the murder rate. This would not, by the way, make us an uncivilized country, it would just emphasize the fact that we are a nation that does not accept cold-blooded murder, without ample justification, as a staple of everyday life. 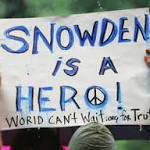 Is Edward J. Snowden a hero, as the sign says, or a treasonous villain who, possibly, as an operative for a foreign government, was under orders to pull the teeth out of an important government counter terrorism operation. I would say he is probably a patriotic American who came across the information that our government was illegally accessing phone records and was so fed up with the insidious tactics of the Obama administration over the past 5-1/2 years, he felt that he had to do something . . . something rash, even if that would put him in danger. Today the ACLU filed suit against the Obama Administration, charging that their mass collection of phone records is illegal. I don’t often take sides with the ACLU, but this time I’m behind them. This time they are going up against a president who acts more like a Czar that an American president. A president who has made it clear through his actions and through the actions of his appointees that he believes that there is no law, civil liberty, tradition or precedent in the United States that is more important to him than his personal/political agenda. I may be wrong about Snowden and his motives, time will tell on that one, but it’s been apparent (at least to me) from the very beginning of his administration that neither Barack Hussain Obama or his political appointees can be trusted or believed.